There are 1,508 items available. Please enter a number less than or equal to 1,508. Roomba works great! Quick free shipping always a plus! 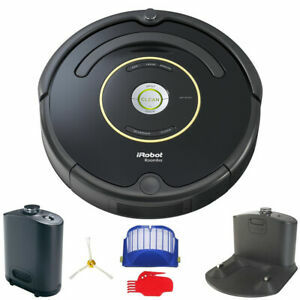 This Roomba 650 needs to be developed further. DO NOT EXPECT IT TO REPLACE YOUR VACUUM. The best thing about it it cleans under the beds. So far it hasn't learned its way around the house. It may go back and forth numerous times covering the same area. However it does clean the carpet, ceramic and hardwood floors pretty good. It may be a little early making this determination as we have only used it about 12 times. The concept is good, the idea is great it just needs some more engineering work. So far it can't find the base easily and we have a 1 floor home. It's cost is substantial for what it does. It's a nice conversation piece. I bought it as a X-Mass gift, after my friend told me about it. He thought it was great. So I guess it's a matter of different opinions. How ever I don't know what his wife thinks. MY FINAL DETERMINATION AS OF 11-18-18 DON'T WASTE YOUR MONEY. NEEDS MUCH ENGINEERING. This is a refurbished unit. We also have a "new" unit of the same model. This one performs as well as the "new" model with one exception. The battery in the "new" model seems to last longer than the refurbished one. This one runs for about 1-hour +. It is quite easy to clean, which should be done after each use. This only takes about 5-minutes, or so. It's amazing how much dust, lint and dog hair it picks up, even immediately after our cleaning lady finishes for the day. It gets up close to walls and furniture, as well as into corners. I would recommend this unit for anyone with or without a pet to remove dust and/or pet hair between floor cleanings. Roomba 650 works great - mostly! Really good product that will be useful in keeping dust levels down in our house. Well engineered, gets out of jams nearly all of the time, cleans in places we couldn't even imagine. Goes from hardwood to tile to carpet across carpet tassels and lamp cords all without issue. It just goes and goes, disappears under the furniture, comes out the other side, and is quite fun to watch. Comes with one Virtual Wall, but you'll need to buy at least one more to make it useful. And, you get to play the game, "Where's my Roomba?" Siri likes him, too. Minor problems - it cleans a random pattern that continually angles back and forth across your room and will travel from room to room unless you wall it in (close doors, use Virtual Walls) to try to finish the current room. It doesn't clean all of the room due to its programmed, but seemingly random, wanderings. So, in our early opinion, it won't in fact vacuum the entire floor of any room on a given cleaning cycle. But it will vacuum at least 60% of it, more the longer you leave it. And the next time you turn him loose, he might vacuum the spots he missed the last time. On carpet, it leaves an angular pattern on the nap that is a bit unsightly, rather than the inline vertical patterns you leave when you manually vacuum. Another problem is, you have to watch the Roomba and move the Virtual Walls to keep it confined and out of trouble, especially if you have a more open floor plan as do we. And then, although it doesn't get caught in tassels (amazingly), it does mess them all up crossing back and forth. So afterward, you have to comb out all your tassels. All of this is of course extra work not intended. However, if you manage it to keep it away from the tassels and learn how best to wall it in, I'm sure it will get easier to use going forward. So, 5 stars from an innovation and build quality point of view, but only 3.5 stars from a truly useful functionality point of view. Overall, we would recommend this product. We don't know how useful it would be buy the higher priced models. I had no idea how a device could enhance my life! After all, I am use to dishwashers, water heaters, washers & dryers. But a vacuum that cleans my house for several hours every day? I have 3 dogs, and lots of dirt. This IRobot picks up more than I do using a Dyson! I have made compromises, like re-staging a few pieces of furniture that the IRobot gets stuck under, but, all in all, I am very pleased and would recommend this product to other pet owners!